We the family members of the Indigenous People of Biafra (IPOB) worldwide condemn the ongoing religious persecution, harassment and arrest of IPOB members especially those of the Shalom Synagogue Church of Israel in Aba, Abia State last week. It is unfortunate that the Nigerian Government and it's security operatives, especially the DSS and Police, have reduced themselves to playing the role of religious police and have effectively constituted themselves to instruments with which enemies of Israel within the corridors of power in Nigeria, are now using to suppress those that practice Judaism. 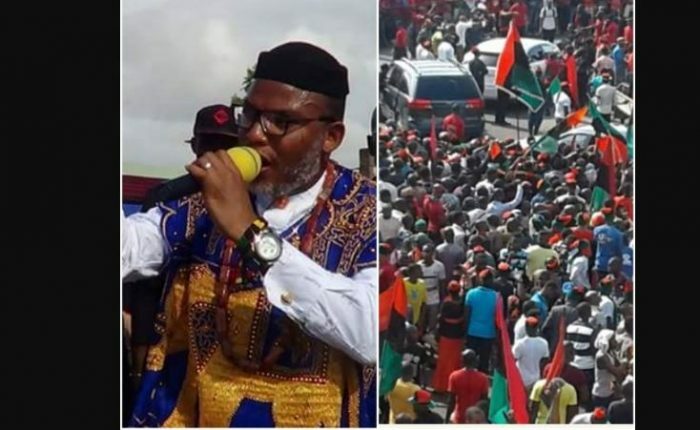 It is on record that IPOB activities are firmly anchored on the finest Judeo-Christian traditions, which has made Biafrans and IPOB in particular the target of these state sponsored indiscriminate and arbitrary arrests of innocent civilians by agents of Nigerian government in pursuit of an Islamist agenda. There has been repeated raids of synagogues and places of worship in Aba and Igweocha (Port Harcourt) respectively. Security operatives whose constitutional role is to protect the lives and property of citizens, have now turned to instruments of oppression against innocent civilian populations. Arresting members of Shalom Christian Church because they are connected to the Jews in Israel is religious discrimination of the worst kind. Every religion has a root and in as much as nobody can deny that Saudi Arabia is the root of Islam, nobody can deny that Israel is the foundation of both Judaism and later Christianity. Discrimination based of religious affiliation to Israel is misplaced and a crime against the very principles of freedom of worship and association. Since President Trump announced US recognition of Jerusalem as the eternal capital of Israel, the wave of arbitrary arrests and persecution of Biafrans that practice Judaism in Aba and Igweocha (Port Harcourt) have dramatically increased. Nigerian Government, by towing this path, is setting a very ugly and dangerous precedent. Those arrested for their faith must be released immediately including all those illegally detained for expressing their legitimately held views that they are better off in Biafra than Nigeria. We want to bring it to the notice of the entire world what IPOB in particular and Biafrans are suffering in general at the hands of this Buhari administration. The world must therefore prevail upon Nigeria to desist from this blatant religious persecution and release those in their custody. Members of the Shalom Synagogue of Israel in Aba did not commit any crime known to law. They are a spiritual congregation merely being persecuted for their spiritual connection to the holy land of Israel.